Pomplamoose; "Don't Want to Miss a Thing"
When Jack Conte told me that Pomplamoose was going to cover that silly pop song from the movie Armageddon, I was thinking, okay, "crappy silly dramatic love song that this band will make awesome." And they did. Of course. Everything that this band touches they turn into diamonds, or gold or.. whatever. What makes this song for me is Nataly's ghostly angelic vocal interlude right after the bridge at 2:18. I've played just that little bit about 12 times now. It's absolutely stunning. 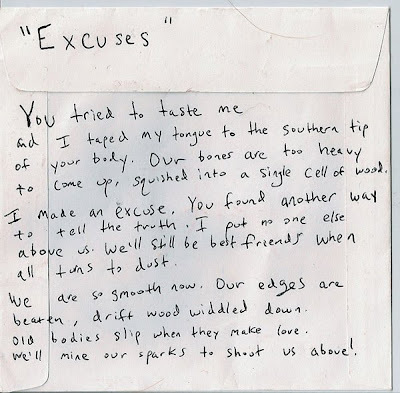 Pomplamoose produced Nulia Nune's most recent EP I Think you Know and the track "Through the Floorboards" features a vocal track that sounds very similar to the one you'll hear here. Remember being under 21 and wanting to go out? I lived in Los Angeles and still ended up getting a fake ID. I mean I missed freaking PAUL SIMON at the House of Blues because I was under 21. I ended up hanging out outside with the doormen and watching the show on the monitor for smokers. That was not right, people. People under the age of 21 need a variety of places to go, that aren't just punk clubs. Not all kids are interested in that kind of music. As I'm among friends and family here I'll spare you a long pitch and just ask for your help in securing a $50,000 grant from Pepsi for a non-profit organization called the All-Ages Movement Project (AMP) that advocates for and support people nationwide in starting, running and maintaining all-ages arts and music spaces. Since you know me, you also know how important the cause of all-ages access to music and art is to me, and I can assure you that if AMP is able to make these projects happen it will help address some critical issues in creative communities across the country. Any help you could offer over the few days by voting and encouraging others to vote through facebook, twitter, emails etc. would be greatly appreciated. You will not receive Pepsi spam unless you specifically check a box requesting to, so don't worry about that. Being critic when you don't like a show, how to review? If you read this blog in any sort of regular way, you've probably noticed that I gush, a lot, about the different types of music that move me. As a blogger I can write about whatever I want, even with Examiner.com. I scope out the music world and see what's worth sharing with you. I look at the calendar see what looks interesting to me. Because I'm not being assigned stories by an editor, I usually choose to write about things I already like. Makes sense right? I'm not doing this for a ton of cash (long way off there) so of course I'm going to write about things I will be able to say nice things about. Even if there are elements I don't like, I can usually stress the parts that were good over everything else. Some have called this "sugarcoating," fine, I can live with that. But what happens when I really can't think of anything nice to say, and I really don't recommend that people go spend their money on it. It's certainly my responsibility to say it, even if I feel bad about it. If I never wrote anything bad ever, why would anyone trust my opinions? I end up feeling bad because the artists usually give me free tickets which even after a year of writing I'm getting used to, but then I feel guilty for saying bad things. Well, this is when being a critic and journalist (a term I'm still getting used to when referring to myself) is all about. So, I say "bring it." I can take it. It's good for me! So, I just saw this musical called Mahalia: a Gospel Musical over the weekend. It was, well, very disappointing. I mean, I LOVE gospel music. I wrote a freaking 100 page master's report on the topic. I've seen incredible musicals like Crowns and A Color Purple that blew my brain right out of my head (ew). I would figure that if you cast a singer to portray one of the greatest voices, you would find someone who can really sing. Considering that Oakland has a large African American community, you figure it wouldn't be that hard. 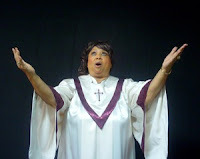 How many female gospel singers live a stones throw away from San Francisco? Anyway, the singing was what I decided to focus on in my review. Other reviewers tore down the acting, the directing and the blocking (yes, it was bad, folks). But I would be very interested to see what you think of my review, even not seeing the show (don't please, save your money). Was I TOO nice? Did I say anything below the belt? Thanks for reading by the way, I am so lucky to have such awesome fans. The SFJAZZ fest is one of the most reliably exciting festivals I've come across in this country. The variety of talent that comes to the Bay Area from across the Bay and across the globe is astounding. 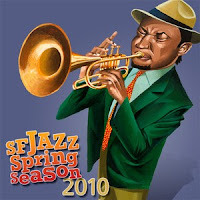 When I first picked up the brochure for the 2010 Spring Season, my jaw dropped: Joshua Redman, Bobby McFerrin, Keith Jarrett, Dianne Reeves, Ladysmith Black Mambazo... the list just goes on and on. There are festivals like the New Orleans Jazz & Heritage Festival where the word "jazz" seems like it's either a guide for picking music or a remnant of another era. SFJAZZ is both. I would say that music in the jazz idiom is in the majority of SFJAZZ performances, but the idea of "jazz" has been stretched to include R&B, Afropop, Fado, Samba and singer-songwriters. As a lover of international music, innovative musical fusions and straight up good musicality, I wanted to shine my humble spotlight on some of the 2010 SJFAZZ Spring Season's acts that might be a little more obscure and/or interesting. READ THE REST OF THE ARTICLE HERE: my picks include Malian Tinariwen and Salif Keita, South African Ladysmith Black Mambazo, Singer/Songwriter Raul Midon, Saxophonists Joshua Redman and Pharoah Sanders and Kurt Elling and the Basie Band. The "Seattle Times" wrote: "Listening to the King's Singers is just about as much fun as you can have in public with your clothes on!" The King's Singers are SO English. And what I mean by that is that they are classy and silly all at the same time. And the silliness is so subtle with a look or a small movement. Some of these guys are so dignified as classical singers, but all they need to do is look at the audience and wink, or raise their eyebrows and send everyone into hysterics. Tenor, Paul Phoenix, is the most fun to watch as his whole body moves and bounces as he sings (see, look at him third from the left in the photo above). Dressed in dark velvet blue sports coats and light pink ties, even their wardrobe reflects this attitude. The first half of the concert was full of classic madrigals including my fav by Monteverdi (see yesterday's post). They also performed a commission that was written by Bay Area composer Gabriela Lena Frank called "Tres Mitos de Mi Tierra, or Three Myths of My Land" which was full of insanely impressive and difficult rhythmic devices that made my jaw drop. When the piece was over Frank, who was sitting in the audience, hugged each and everyone of them. You could tell she was absolutely delighted and adored them personally. In the second half, the King's Singers lightened up the vibe with Randy Newman's "Short People" (yes, we're looking at you David Hurley - so cute! ), Billy Joel's "Lullabye (Goodnight My Angel)" (listen below), and a Harry Connick Jr. tune. I even spotted Jace Wattig from Chanticleer and chatted with him for a little bit during intermission. My friend and his friend bonded over their experience singing collegiate a cappella at Brown University. As always, it was a fabulous time. 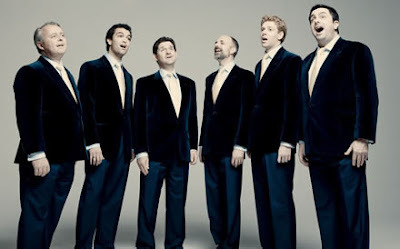 I thought since my last week has been musically full of Billy Joel and the King's Singers that the signs are telling me to bring the two together and share this video with you: The King's Singers perform Billy Joel's "Lullabye (Goodnight My Angel)" arrangement by Phillip Lawson. When I was in high school, I was not into Green Day, I was not into the Backstreet Boys, I was a fangirl for The King’s Singers. I was choir nerd. Maybe not so nerdy like Rachel in Glee, but I loved professional and amateur singing groups like Chanticleer and a cappella college choirs. 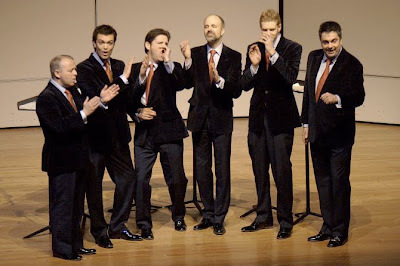 The King’s Singers have been the preeminent ensemble in the world for a cappella. Tomorrow night I get to see them live for the oh, maybe seventh time? I'm not kidding. I know for awhile there I was seeing them every time they came through Los Angeles in high school. I've also seen them in Ann Arbor, Michigan and in Washington, D.C. I've waited to meet them after shows and asked them sign books and CDs for me. I've also gotten to watch them teach master classes with community and high school groups. Like I said, I'm a fan. In this world of aging rock stars, it's nice to know that two of my favorites still have what it takes to put on a solid arena show. 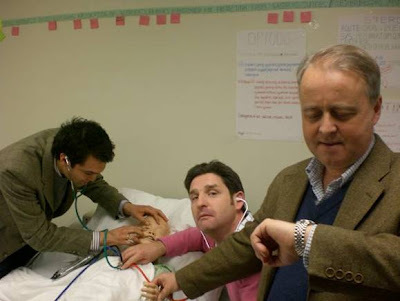 After postphoning their November show due to illness, it was rescheduled for my 30th birthday. Not a bad birthday if you ask me. I have been a fan of both Elton John and Billy Joel for years. I sang their music in elementary school and high school choir. I can still recite all of the lyrics to "We Didn't Start the Fire" and I still get goose bumps when "Your Song" comes on the radio. 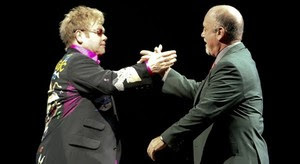 Billy Joel and Elton John's "Face to Face" tour is the longest-running and most-successful co-headlining bill in music history. Their fan base overlaps and the energy of their music is quite similar. With 40 studio albums and over 80 top 40 hits between the two of them, there is no real possible way this show could have been bad. At 61 Billy Joel still has his swagger (borderline creepy) and at 63 Elton John sounds as good as ever. And both have fingers that have no trace of slowing down over those lovely ivories. "Anyway, this song is from 1934..."
Later he grabbed an electric guitar for "We Didn't Start the Fire" (I never knew he played!) and then pranced around the stage for "I'ts Still Rock And Roll To Me." The women in the front row LOVED it. My favorite aspect of the Face 2 Face tour is how the stage is rigged. Having two separate bands, the stage has to accommodate many people. The entire stage is rigged with trap doors and revolving platforms. We were sitting behind the stage, stage right over Elton’s left shoulder, and we had a perfect vantage point watching the various five drummers ascend and disappear into the stage depending on the song. Musically, I'd have to say that the high point of the night was hearing the guys trade short piano solos in "Bennie and the Jets" towards the end of the show with Elton John's New Orleans steeped style versus Billy Joel's more jazzy flavor coming at the audience in two measure phrases. That was incredible. Here is a playlist of the set list: what did I tell you, just one hit after another. Today is my 30th birthday! I'm happy to leave the 20's behind and start acting like and adult. HA, yeah right. I know a couple other people with my same birthday (I was with one of them last night at midnight and we sang to ourselves) and in an attempt to wish them a happy birthday, I remembered the Beatles' song "You Say it's Your Birthday." I never really thought about it, but this is a pretty terrible song. 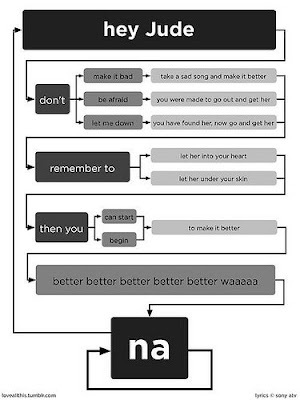 Thanks Paul McCartney. For my birthday I've arranged for Billy Joel and Elton John to personally serenade me, my Mom, my Dad and 25,000 of my closest friends at the Oakland Coliseum. Can't wait. They have good burgers too. 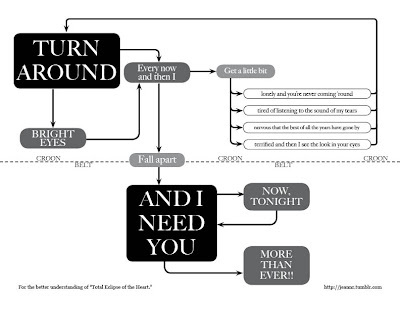 Thanks to jeannr.tumblr.com for creating this and Erin over at Depictionary for posting these: We love them. Saturday night I was down in San Diego for work and wanted to take my 16-year-old cousin out for a nice evening. Going to the movies didn’t seem special and she’s not the kind of kid I would take to an all-ages punk show. 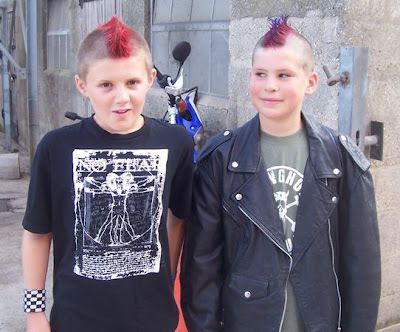 And lets face it, I didn’t want to go to a punk show either. 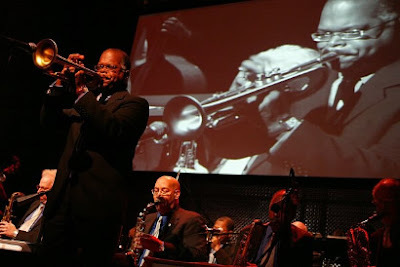 I saw that Anthology is all-ages and that the Count Basie Orchestra was rocking the house for two nights. This legendary Kansas City big band is swinging towards San Francisco and will be performing on May 30th at Davies Hall with Kurt Elling as part of the SFJAZZ spring season. Celebrating their 75th anniversary, the Basie Band has never sounded better. It’s obvious from the smiles, the goofiness, mutual encouragement and choreography (the trumpet section has it down) that these guys thoroughly enjoy themselves on stage. And with songs titles like “Fun Time,” “Way Out Basie,” Right On Right On” and “Cute” a good time is guaranteed. Some members of the Basie Band are new, yet the majority of the sound still swings from musicians handpicked by Count Basie himself. I would guess that at least 75 percent of the band is over 50 years old. Bill Hughes is the current director and has been in the band since 1953. That’s pretty incredible if you ask me. Basie hired singer Carmen Bradford in 1982 when she was 22.